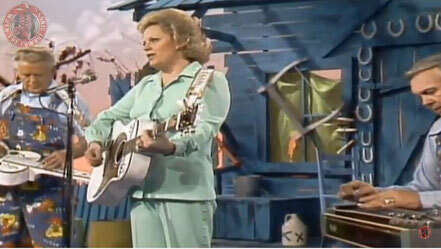 Donna Darlene performs "What's Wrong With The Way (That We're Doing It Now)" on Hee Haw 1979. Donna Darlene was born in Kane, Pennsylvania. In August 1952, the town of DuBois, Pennsylvania was going to celebrate a three-day "Mardi Gras". This was an attempt by the local minor league baseball club based in DuBois to raise some funds for their operation. If the event was a success, it would be repeated again 1953 and much larger scope and planning would start immediately. Part of the Mardi Gras "festivities were to be an amateur contest, there were several divisions of contestants, Specialties Division, Vocals Division (individual and duet), Vocals Division (Three or more Voices), Accordion, Instrumental and Demonstration. Allen Brothers and Donna Darlene (who were around 14 years old at the time) were in the Specialties Division and were "Hill-Billy Specialties".